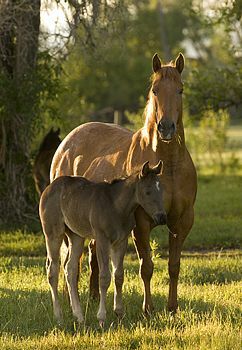 ​ Three Bar Quarter Horses!!! ​​We would like to tell you a little about our family and introduce you to our horse program. 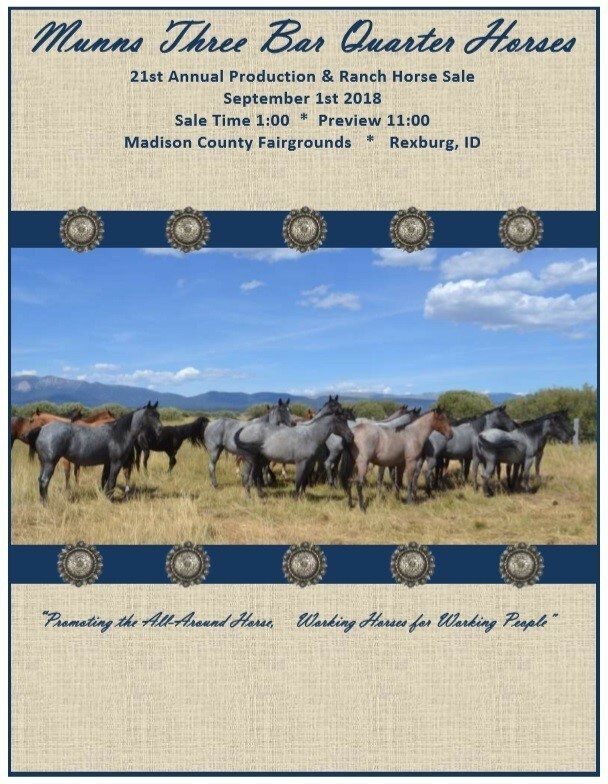 We invite you to browse through the horses on our website and take a look at what we will offer in our Annual Production Sale. We are always exited to talk horses and share our enthusiasm with other horsemen around the nation. 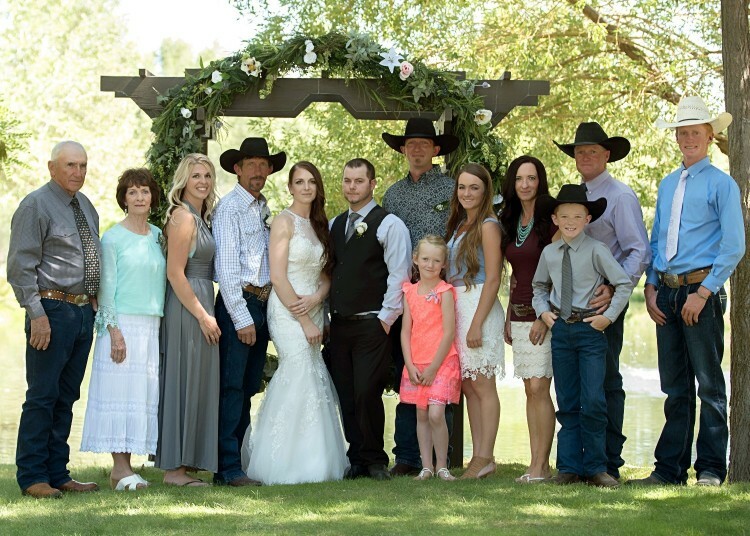 Keith and Ruth started this whole thing over 50 years ago when they were married in 1962 and soon after purchased their first Quarter Horse mare. They have been involved in many aspects of the livestock industry, but the one consistent key element in their lives has been the horses. They bred Quarter Horses and black and white tobiano Paint Horses for a number of years. Through the years the program has phased the paints out and evolved to focus on the “older style”, foundation bred Quarter Horses. Many of our mares carry Driftwood and Hancock bloodlines, as well as High Rolling Roany and Blue Valentine. Color has never been a priority to us, but as we have chosen stallions that have the qualities we are wanting to replicate, we find ourselves knee deep in roan horses! We have a set of black mares that are all daughters of Blackwood Twice x Drifts Chip. 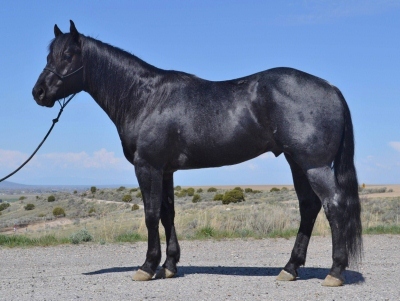 Those black mares have crossed well with our blue roan Hancock bred stallions to produce true blue roans with stunning black heads and legs. We have focused on maintaining a solid, sturdy foundation in the conformation of our horses. We want substantial bone and foot under one, deep girth, strong muscling, good heads, and adequate size. Along with eye appeal we also put an emphasis in an intelligent, responsive, willing disposition. Our colts are raised in the rocks and brush in plenty of open country to help them develop good instincts and sure footed abilities before their training ever begins. We feel that this gives us an edge in training a confident ranch horse that is enjoyable to ride both outside or in the arena. Keith and Ruth have 2 children. A son Jeff, and a daughter Becky. Both of whom love the horse industry and have remained a part of the family business. Jeff and his son Kolton both enjoy team roping and are proud to be well mounted on ranch raised geldings. Both work year around for Keith and Ruth. They take care of the farming, start a few colts, works with the babies, and take care of the basic day to day operations. Jeff also has two girls, Kassie and Katie. They both attended college in Twin Falls and have ended up settling there for the time being. Both completed their schooling and have rewarding jobs and are content there. They enjoy coming home to help in the summer and always do a good job handling the paperwork for the sale together. ​Becky has always had her father’s passion for the horses, and was fortunate to find a husband that shares in this love as well. She married Dan Miller in 2005. Like Keith and Ruth, they have built their lives around the horse industry and spend most of their time a horseback. They have 3 children who all ride with them as well. Breanna is starting her senior year of High School and is very involved in rodeo. She competes in all girls events and takes pride in always being well mounted. She had a successful HS Rodeo season last year and earned the 2018 Girls All Around saddle in a tough district, qualifying for state in 6 events. It was very rewarding watching her meet some goals, and do it riding horses raised by the Munns Family that she has trained herself. Ty is 11 and has spent a good share of the summer with his dad on the Forest Allotment riding with him. However, his first passion is without a doubt “Farming”. Charly is 7 and the youngest Munns granddaughter. She finally has a horse that is labeled “her own horse” this summer and it has been fun to watch her enthusiasm and work ethic grow with that ownership. She is going to be right in Breanna’s footsteps soon! Our Annual Production Sale is held the Saturday of Labor Day Weekend each year. This year it falls on September 1st, 2018. The 2018 foal crop will be sold, as a well as a couple fancy young stallion prospects, and 20 head of nice saddle horses. These horses have had countless hours spent on them doing all basic ranch jobs, riding the forest allotment, and some time in the arena as well. We strive to prepare our young geldings in a way that they could go about any direction you choose to take them and have a foundation in place. We want our customers to buy with confidence and be able to find the right horse for them. We put a lot of effort into preparing videos, taking lots of pictures, and providing as much information as possible. Please help yourself to the online catalog and individual videos. If you have any further questions contact one of us. We are always happy to help and LOVE to “talk horses”!